Do you shop on amazon? You can now support JOSHUA while you are shopping on amazon with no extra cost or hassle. The only difference from “Amazon Smile” and “Amazon” is that when customers shop on AmazonSmile (smile.amazon.com), the AmazonSmile Foundation will donate 0.5% of the price of eligible purchases to the charitable organizations selected by customers. How do I link my Amazon account to JOSHUA’s amazon smile account? 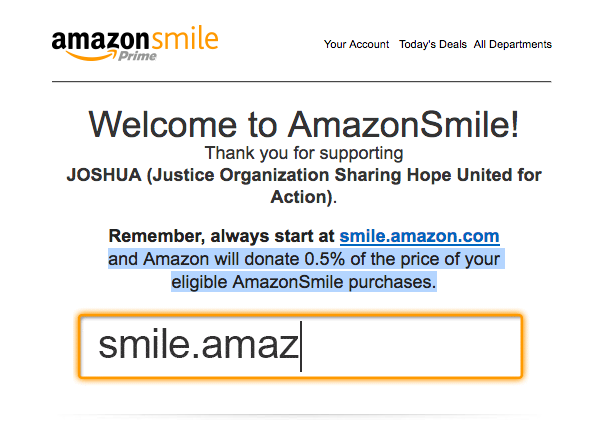 **please note when you sign up with the JOSHUA Amazon Smile account that you will be reminded in order to support JOSHUA with every purchase you make, make sure you start with smile.amazon.com and Amazon will donate 0.5% of the price of your eligible AmazonSmile purchases. You will receive a confirmation email that looks like this! Already support another charity but want to switch to JOSHUA? Then you should receive a email that looks like this! Have questions about how to bookmark the page, or shopping with the Amazon app? Know someone else that shops amazon a lot? Send this page to them and ask them to support JOSHUA with their amazon purchases! Please email us at joshua4justice@gmail.com if you have any questions!